Eastside pest control recommend that you follow manufacturer’s specifications for cleaning all items. Eastside exterminators cannot provide specific cleaning techniques for personal items Clothes, blankets, and linens should be laundered. Items such as shoes, luggage and other materials not treated with pesticides also need to be vacuumed with the stiff brush attachment or washed with essential oils .It is very important that you vacuum and clean on a regular basis to prevent another infestation. Bed bugs residing within the laundered items; therefore items should be washed in hot water, regardless of normal washing directions, and should be dried on high heat for 40 minutes or more. For those who have the ability to measure the temperature of the water in their washing machine, or of the hot air in their dryer, the target heat range is 140°F. All furniture and appliances in the dwelling need to be pulled away from the baseboards, and in the effected rooms with bedbugs all furniture containing potential hiding crevices, such as bookshelves and desks, be emptied and left open for the exterminator to spray. people believe that bed bugs infestations are a sign of unsanitary conditions, there are several ways for a home or business (especially hotels) to become infested with bed bugs. People often acquire bedbugs at hotels, motels, and bed-and-breakfasts, both domestically and internationally, and bring them back in their luggage. Sometimes, used or antique furniture can be infested and homeowners may inadvertently bring the pests into their home after buying a piece of antique furniture. Finally, multi-dwelling units such as hostels and dorm rooms are very favorable to the spread of bed bugs. In these cases, bed bug extermination can be difficult and sometimes trained dogs are used to sniff out and locate the various infestations. Besides for being a nuisance, many worry that bed bugs can pass blood diseases from one host to another. However, evidence has shown that this is not possible. Still, beg bug extermination is necessary because once these infestations start, they are difficult to get rid of. 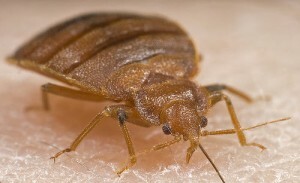 Bed bug extermination usually involves disposing of any sheets, blankets or clothing that came in direct contact with the infected area and then fumigating the entire area. Due to their small size, it is difficult to completely eradicate an infestation without the help of professional bed bug extermination. •One way to get rid of bed bugs is to wash all the sheets in hot water. •Another method in eliminating bed bugs is to place a mattress casing. •Bed bugs can also affect furniture and carpets. •Putting a plate of sticky or acidic solution under each of the bed’s legs can prevent bed bugs from entering your sheets. •If you’re unsure of how to go about attacking bed bugs, don’t hesitate call a professional pest exterminator today! •Bed bugs will bite humans and can cause skin irritation and itchiness. •Bed bugs have been linked to bronchial asthma in residents. •Bed bugs can live an entire year without feeding. •Pest control providers should guarantee a bed bug solution in a timely fashion once notified of the problem. •Qualified pest exterminators should be able to eliminate bed bugs humanely and safely, without leaving dangerous poisons or traps around your home. Bedbugs provide a real pest removal challenge, even to the seasoned professional. Bed bugs can thrive in an average home, living in tiny cracks, under mattresses, or behind old wallpaper and feeding off of you and your family. Not everyone reacts to bed bug bites, so finding the pests early is a challenge. As with most pest control situations, a good offensive is better than a good defense. That is certainly the case with bed bug control; learning what you can do to keep your home free of these pests is the best first step you can take. Knowing your surrounding especially when travelling is very important. Bed bug prevention means understanding the needs and habits of the bed bugs themselves. Remember that these pests prefer to live in spaces that are rough, dry and dark. They like wood and paper the most, and can easily fit into nail holes, floor cracks and openings in window sills; behind old wallpaper; and inside a wooden bed frame or mattress.